Color LIFE illustrates the reproduction behavior of microorganisms. The reproduction rules can be free selected likewise the incremental width and output time of the generations. Color-palettes can be produced on your own. With a shape-run, new rules and nice graphics can be found. 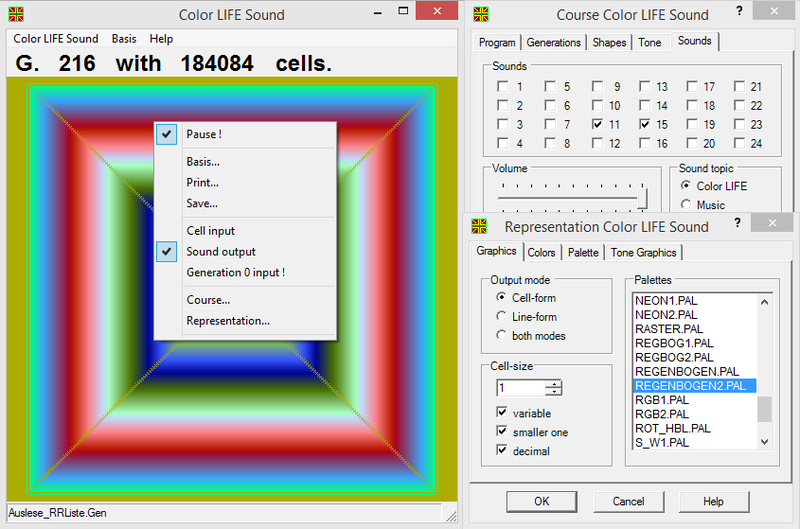 Color LIFE Sound plays the cell pattern with 3D-Tones and shows the sound graphics of each generation with it. To this can be selected 24 sounds from four different sound themes in each case. The area-size, the bar and the volume is variably adjustable. Universal settings can be saved as file. An addictive computerized Pinball that looks and reacts like a real bar machine. Color LIFE illustrates the reproduction behavior of microorganisms. If you download free games, Trial Bike Ultra is one of many to choose from. If you like powerful offroad cars and overcoming obstacles, this is your game!